Ms. Catherine Lee is the Assistant Director of Bamboo Curtain Studio since 2011. After she received her Master degree in Museum Science Program at Texas Tech University, she served as the project manager on community museums in National Development Initiative Institute (2003-2004, Taipei) and the executive secretary in National Science and Technology Museum (2004-2011, Kaohsiung). She participated in the project of “Art as Environment: A Cultural Action at Plum Tree Creek” as the education coordinator in the program of “There is a river in front of my school” when she has worked in BCS. Since then she has collaborated with curators, artists, designers, researchers, historians, scientists, ecological experts, environmental activists, community groups who have dedication to the environment issues through cultural actions. 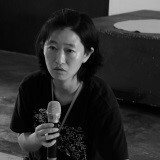 Catherine has also participated in the several projects that Bamboo Curtain Studio has carried on for so many years: “Residency and Exchanged Program in Bamboo Curtain Studio”, “Web Platform and Research on Artists Residency and Mobility in Taiwan”, and “Strategic Planning and Implementation of Creative City, Taipei”.